Now everybody in the room put your hands up and FREEEEEEZE! This is the Police and you have two options of leaving, in cuffs or in a body bag. If you are looking for a game that looks at the darker side of being on the police force that has frequent dealings criminals whilst trying to avoid the pull into the seedy underbelly of the City controlled by the Mafia, This Is The Police may be right up your alley. This Is The Police is published by Nordic games who are known for their Darksiders series and their upcoming game Battle Chasers: Nightwar. They have offices in Vienna, Karlstad, Munich and Phoenix and have software on multiple platforms including PlayStation, Xbox, PC and Nintendo. 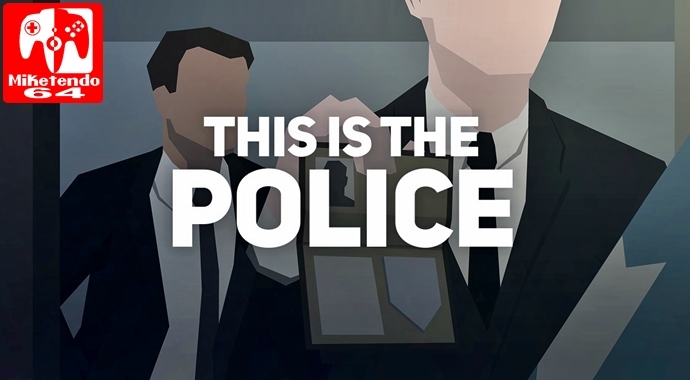 In This Is The Police, you take on the role of Jack Boyd, A gritty no-nonsense police chief of Freeburg City PD. Your retirement is coming up soon and you have to raise $500,000 before your 180 days are up. It isn’t easy though as you have to make difficult choices to walk the line between the straight and narrow or follow a more unconventional route that is corrupting the rest of the city. Choosing to do the right thing or making a tidy cash packet will determine your fate as you dodge press questions, solve crimes, manage your staff and keeping the Mayor off your back as he devilishly exploits anything and everything for his personal and political gain meanwhile the Mafia are pulling trick to entangle you in their trap. If you thought ordinary life decisions were hard, you have seen nothing yet. This Is The Police will have you make life or death decisions that will ultimately affect if you make a clean retirement or end up a certain creek without a paddle and there is a hole in the boat. The game is played like a Noire Graphic Novel/Newspaper Comic Strip with cut-scenes to tell the story and the events that unravel after your long day at the office with narration by John St John, the voice of Duke Nukem. The scenes are not much to look at and seem pretty ominous and bleak but that is pretty much the point. The characters don’t have faces so the player has to visually imprint their own imagination to build up what these characters look like. The actual gameplay part is like a management simulation with a point and click style, which has a series of text boxes one after the other to paint the scenario of each event/crime that takes place. You also have two different shifts of staff that you have to manage and organize. Some crimes may require you to send out multiple officers and sometimes even SWAT, other times you can get away with sending out one. Every decision you make has repercussions, that could end with the criminal escaping or the victim injured or killed or even your own officers meeting their maker. Every time you respond to a call and send out your officers, it takes time for them to respond and return to the station. In this time, other events can take place and other call-outs which could leave you without officers to respond to more serious crimes. The sound effects are little more than audible aids to accentuate what is occurring like the sound of running to signify that a perpetrator has escaped, sirens to show that your dispatched units or responding to each call. The actual soundtrack to the game is limited to a choice of 6 or so LPs to play in the background whilst the day plays out. Some can be relaxing but that can get pretty repetitive and wish that there were more tracks to choose from. This Is The Police has a lot of promise but it is not without its flaws. There is plenty of politics that touches on views like racism, corruption and embezzlement that might be too much for a player to want to deal with in a management sim. There is plenty of that in any GTA game which provides more action and engagement with proper visual comprehension as opposed to a simple text box saying “You must fire all black cops because there is a racist gang going around beating up black people” If you choose not to fire them, you get another text box saying “You have failed the mission” Excuse me? I have failed because I choose not to let people go simply on the premise of the colour of their skin? This can be misconstrued on so many levels, but where you are only given two choices, to fire them or to keep them on. In real life, I am pretty sure you would inform every officer this would concern and inform them of the problems and let them make the decision to stay or leave the department as opposed to sacking them simply because the “Not so Good Ol’ Mayor” told you to, which I find to be very distasteful and tacky. It is not a bad game but I can’t really give it much praise. There are some things it does nicely like a different take on telling the story as opposed to other games. The gritty nature of the game that gives you a new found respect to Police Chiefs around the world and the difficult jobs they have and the balance they have to maintain between corruption from above and below them in the places we live in. It is one of those kind of games that you will probably only play through once and then let it gather dust or delete to regain drive space.